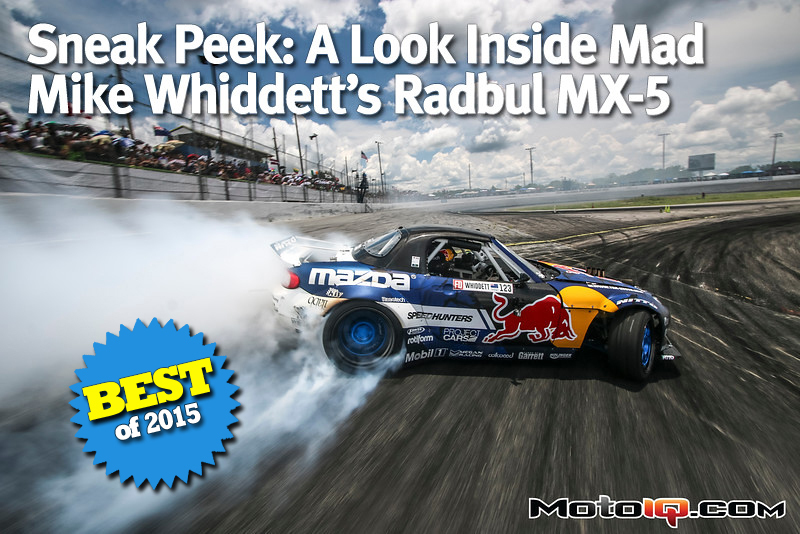 A few weeks ago we were fortunate enough to get a close look at the car that we think is perhaps the most radical and innovative drift car ever built, Mad Mike Whiddett's Radbul Mazda MX-5. 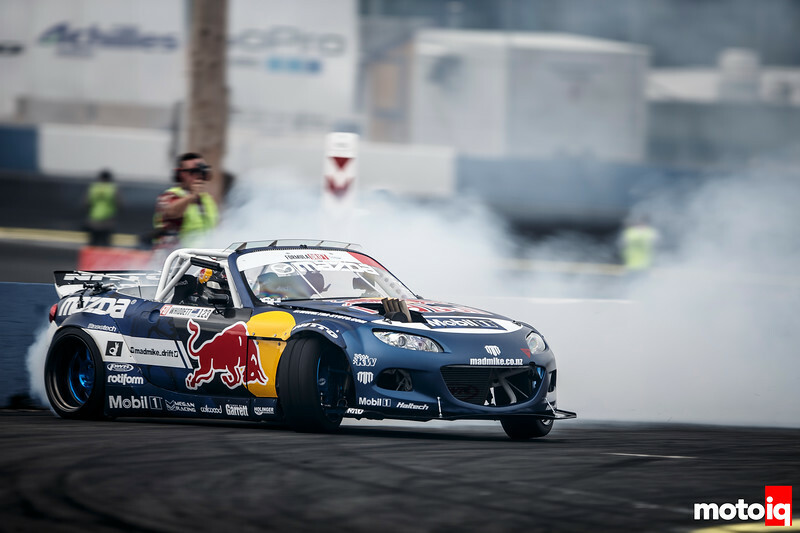 After a 5 year absence, Mad Mike is back on the US drift scene with a car built for today's exceedingly competitive Formula D environment. The Radbul is out to break many suppositions about how a drift car is supposed to be and shows great promise. The Radbul is different from other cars in many aspects from its size, power plant, power level and weight distribution. In it's first US events the car has shown plenty of promise. New car blues have given many well established FD team fits and although it's clear that the Radbul is not fully dialed in yet, it has shown hints that it will be perhaps the deadliest drift car ever built once it has some development time. What do we find so fascinating about the Radbul, well let's check it out. How do we afford to have Larry Chen take pictures for us? Get Larry Chen pictures of the Radbul in action via Red Bulls PR department! The Radbul is a beast, it can change directions faster than any current car and is the fastest accelerating car in Formula Drift. The heart of Radbul is the 26B Rotary engine. The 26B is a 4 rotor engine and was previously only available to the factory Mazda team where it was used for Prototype racing. The 26B in Radbul was the vision of Pulse Performance Race Engineering or PPRE. PPRE made the bespoke components for the engine such as the unique 3 piece eccentric shaft and some of the castings that made the consumer version of the 26B possible. The amazing thing about the PPRE 26B is its reliability. When other rotary powered teams have faltered and had reliability issues tying to squeeze FD competitive levels of power out of the 13B or 20B, the 26B seems bulletproof and has kept on giving with no signs of distress all season long! Yup, 4 rotors right there. The equivalent of two 13B's connected together. Although it's a huge engine as rotaries go it is still pretty compact as far as powerplants in general. 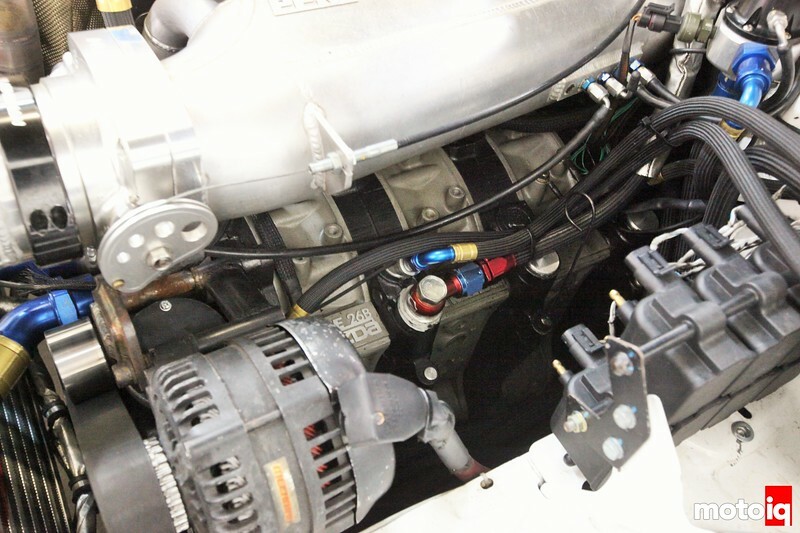 When you consider how much power the engine makes, it is a lot of power in a small place. The beautifully fabricated intake manifold is built by PPRE using a Plazmaman big throttle body. The trick charge pipe clamps are by Plazmaman as well. The eccentric shaft bearings are fed oil via the middle galley on outward by these external oil lines from the drysump system. 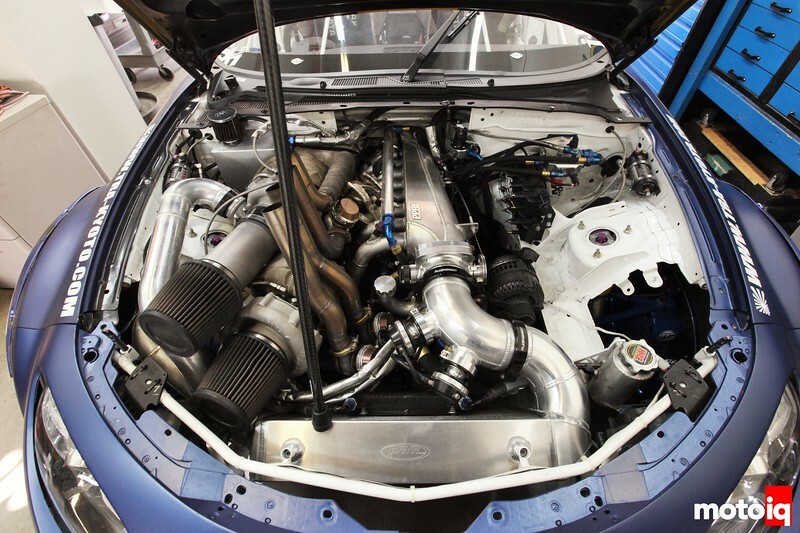 The 26B is boosted by twin Garrett GTX40 turbos. Pretty appropriate for the power level. The car makes 1032 horsepower on low boost and has the potential for over 1500 hp. On low boost the engine is pretty mildly stressed which is responsible for the car's reliability. The engine uses stock rotors and 3mm factory seals, nothing exotic. Mike reports that the engine isn't laggy and has a wide powerband. You can see that the engine is quite compact and sits behind the front axle centerline even though the firewall has not been modified as per FD rules. A low stress turbo, compact 26B 4 rotor seems like a viable powerplant for many potential classes of racing in many different cars. Time Attack car anyone?